By four months, your sweet little one is likely reaching for toys, as well as your plate! Many parents assume this interest in everything you are eating is one of the first signs of developmental readiness to start solids. While such curiosity towards food can lead to an infant’s unintentional first bite (as it was recently for us with our son! ), it doesn’t always mean that an infant is ready to actually eat. This post will help parents to assess developmental readiness to start solids so they feel confident not only in their child’s calculated age when solids are introduced, but also their child’s ability to successfully start solids. Why do you not let your older kids leave Barbie shoes next to their baby sibling or marbles next to the infant play mat? Whether it is just mouthing anything while slobbering on everything, to a more concerning attempt to actually eat a teeny tiny toy shoe, babies instinctively put just about everything into their mouths - particularly by 4 months of age and after. Too many parents assume this part of development parallels pediatrician-approved timelines to start solids and prematurely begin introducing food before their child shows all of the signs of developmental readiness to start solids. What follows is often a negative experience for everyone involved that does not boost the baby’s nutrition by mouth nor nurture a safe, inviting feeding experience for families. This post will help parents to identify signs of developmental readiness to start solids. In recent weeks, I have shared some food for thought on when the experts suggest infants are ready for solids based off of their age. I have also shared some considerations parents should review before starting solids so that they understand at which age(s) the best health outcomes exist, based on when solids are introduced. 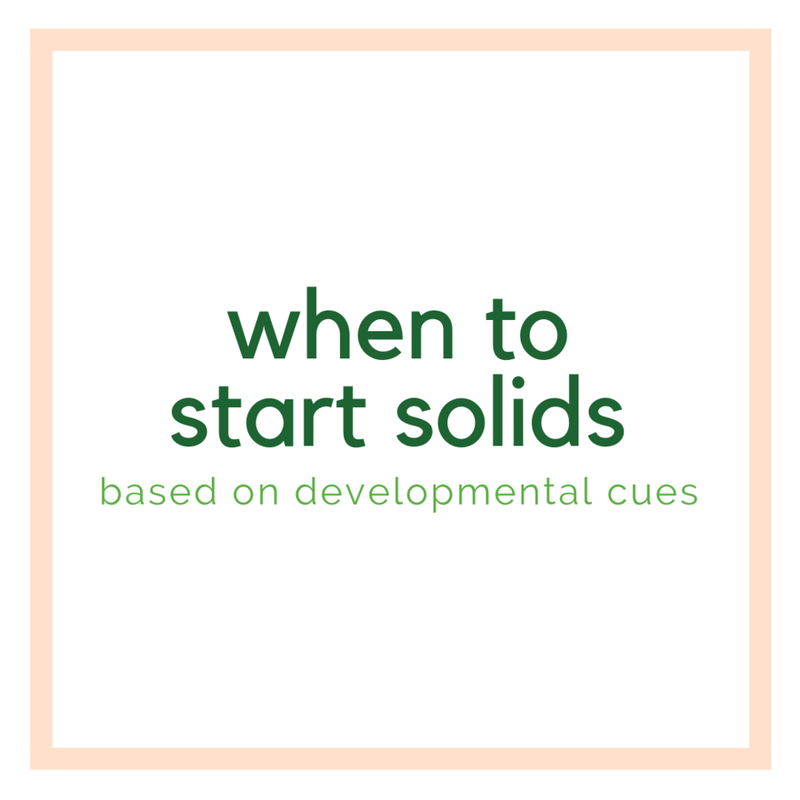 In this post, we will identify cues for readiness that ideally need to occur before solids are started. Do you remember when your child began to demonstrate more head and neck control? Show core strength? Opened their mouth for a toy or empty spoon? Keep contents on a loaded spoon actually in their mouth? Begin eagerly trying to eat whatever you were eating? By now, you may have forgotten exactly when each of these developmental cues first occurred. That’s okay! Because what I can tell every parent is that looking back, all you need to know is what developmental cues happened BEFORE you introduced solids. If you put an emphasis on these, the signs of developmental readiness you will continue to see and enjoy over the course of your child’s introduction to solids will more likely go smoothly and successfully. Too often, parents first memories of their child eating include them pushing the food back out of their mouth (known as tongue thrusting), only for it to be finger-swiped off the child’s chin and offered again into their mouth. Besides the grossness of regurgitated food being scooped up and given again, the whole process is pretty cute and entertaining…the first time. But try to sustain that every time you offer food and the process is going to wear both you and your baby out. Instead, pay attention to their developmental readiness with these cues. Each are critical to the development of the gross, oral, and fine motor skills required for starting solids. Your once bobble head baby should now able to control the movements of his head. Developmentally, this is one of the first cues that occurs before an infant starts solids. Around this 2-4 month window, parents often place their infant in Bumbo-like seats and are amazed with their ability to “sit.” Don’t be deceived into thinking though that you can just go ahead and attach a Bumbo tray and begin solids at any time. Think about the greater continuum. Babies need to develop strength from their head, through their neck, all the way down to their core. With this, they begin showing the ability to sit with assistance and eventually, unsupported by props or other people. But it all stems from their ability to hold their head up. Something that seems to be often contradicted when it comes to developmental readiness for solids is an infant’s core strength. Some reputable sources claim that infants only need to be able to sit with support before solids are introduced. Others suggest that a stronger core is crucial before babies are suitable candidates for starting solids. I tend to lean towards the later, as do most professionals working with infants who use a Baby Led Weaning approach, as this promotes a child’s ability to self-feed more safely and successfully when they can sit unassisted or with minimal support. If you are trying to force a spoon into your infant’s mouth, please just stop. If they don’t open up when offered a spoon, there is a strong possibility that they are not yet ready for spoon-feeding.Communicating with them by reading their body language like this is one of the most innate ways your baby knows to tell you when things are good or just not right. Whether they are not ready now or want to indicate they’re full (and just don’t want anymore spoonfuls so to speak), we as parents must respect their innate desires for more (or less) before you ever try to force solids. This sets the stage for a Division of Responsibility in feeding that stems from starting solids in infancy onward. 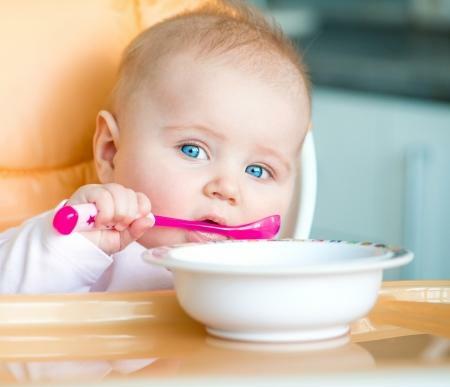 Note that if infants are still refusing a spoon/solids by 7-8 months, consider speaking with your child’s pediatrician or a pediatric dietitian. 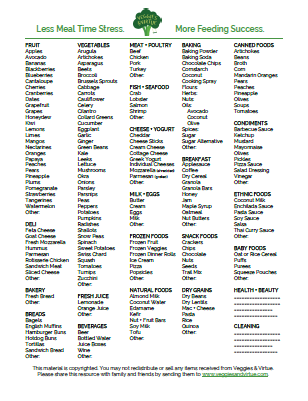 This will help you to evaluate for any other reasons for food refusal, rule out any noteworthy health concerns, create a plan to successfully introduce solids, and ensure the nutritional adequacy of your child’s diet is met as solids are introduced. Could you relate to what I recited as many parent’s first memory with food shared above? That’s because many infants don’t have the developmental readiness to start solids when a food is first put to their mouth. When an infant is fed solids before they have lose their tongue thrust movement, they push foods back out of their mouth instead of learning how to manage such foods within their mouths. Ideally, infants should be able to self-feed (or initiate taking in a spoon), remove food from their hand (or a spoon), move the food contents towards the back of their mouths, and successfully swallow it. While this takes some learning to go from biting/gnawing on a food to learning how to chew and swallow it, the loss of a tongue thrust movement is one of the most preliminary steps. Infants usually don’t develop the ability to pinch between their pointer finger and thumb (known as the pincer grasp) until closer to nine months. Before that, they often rake food with their fingers. Before either of these milestones appear, however, infants are often able to palm items and bring them to their mouths (known as the palmar grasp). Be it with toys or utensils at the table, children often show they are ready for solids when they begin to reach for food and bring it to their own mouths…even/especially when unsolicited! For parents who start solids with their infant around four months, their baby is likely unable to sit unsupported. They may not be able to reach for their own food nor handle a spoon. Unable to swallow standard stage 1 solids, parents often have to thin purees before even putting them on a spoon. This all makes self-feeding strategies (like Baby Led Weaning) a near impossible opportunity at this age and thus, never advised by Baby Led Weaning experts (who advise waiting until six months). Instead, parents who plan to introduce solids on the early end tend to assume a spoon-feeding approach. While more traditional to our Western culture, this is not the only safe and effective means to introducing an infant to solids. It is, however, if you plan to introduce solids before they show developmental readiness to do so based on the skills addressed above. Alternatively, families who wait to introduce solids until closer to six months of age may have a different experience, particularly if they are using a Baby Led Weaning approach. At this age/stage, infants show the developmental readiness to start solids in a way that allows them to become more independent and thus, promotes self-feeding strategies like Baby Led Weaning. In being able to sit unassisted (or with minimal assistance) and reach for the food offered in front of them, infants at later ages and stages (around six months) are able to initiate their first bite literally on their own (with supervision, of course). This opens up more opportunity to families for what type of feeding style they would like to approach the introduction of solids with: being spoon-feeding (with purees) or self-feeding (with Baby Led Weaning). So while an infant’s age appears to make some difference to an infant’s risk for disease and other health concerns like food allergies, it is equally if not more important to also evaluate the infant’s stage for such signs of developmental readiness to start solids. I encourage parents to use the calendar and their baby’s calculated age as a guide for when to start solids, but never to overlook the importance and value of also assessing their infants for developmental readiness as well.